As my garden matures, I am starting to replace more store bought things with home grown treasures. It's easy to overlook some garden harvests if you're not paying attention at the right time of the year, especially if you're growing the plant for another purpose. Raspberries are one great example. 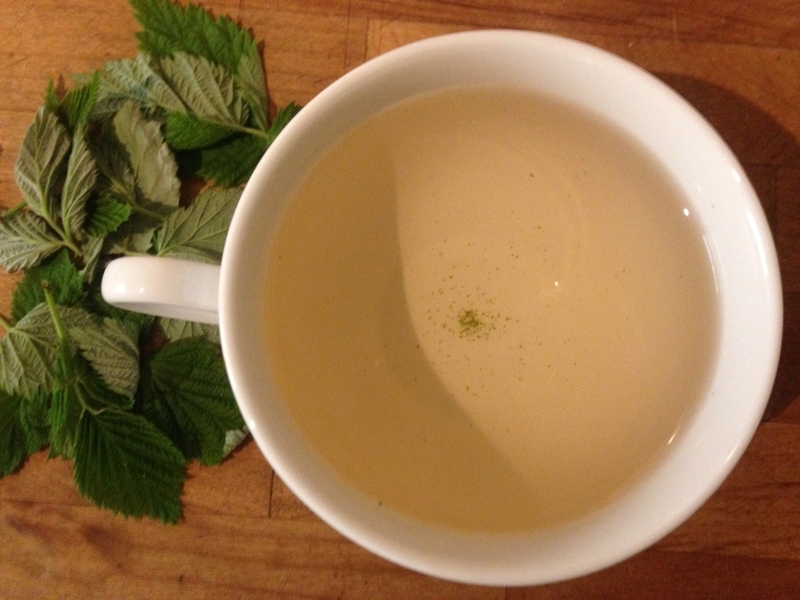 Did you know that you can make a delicious (and medicinal) tea with raspberry leaves? If you're already growing raspberries (or know someone who is! ), read on to learn how to harvest, dry, and brew yourself a wonderful cup of tea. The leaves are best harvested in the spring before the flowers emerge. Choose young, bright green leaves. Since the leaves shrink down quite a bit after they are dried, harvest more than you think you'll need. Start with at least a couple handfuls. I like to harvest a basketful every couple of days in the spring while I'm playing in the backyard with my daughter. I dry them the same day I harvest and slowly add to my jar of dried raspberry leaves. If you have an electric food dehydrator, this is a great way to dry your leaves. Spread your leaves out in single layers on the trays, turn the heat to the lowest setting, and set the timer for about 8 hours. My dehydrator is on a high shelf, so I can never see the time setting. I just crank it on and forget about it until the next day. That's the beauty of food dehydrators - you can literally turn it on and forget about it! 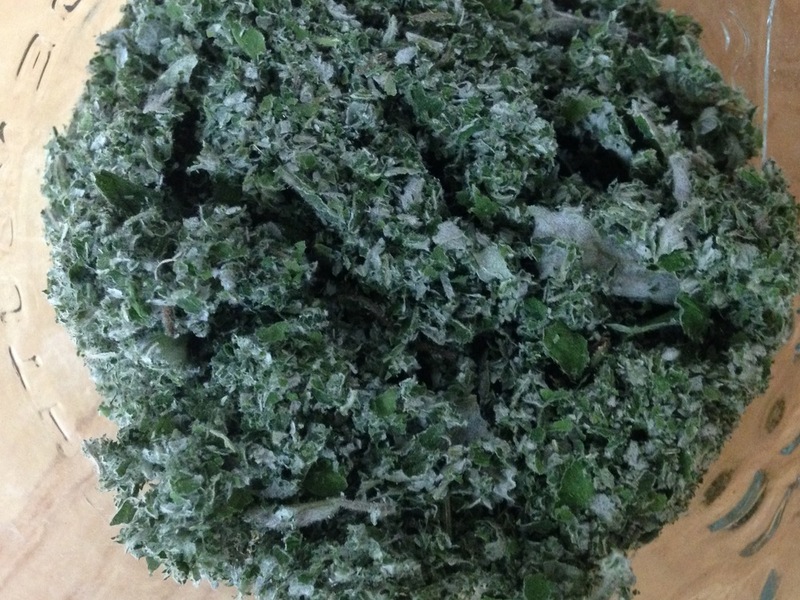 If you don't have an electric dehydrator, you can easily dry herbs in your oven. Lay your harvested leaves in a single layer on a cookie sheet, turn your oven on to the lowest heat possible and leave the door slightly open. Check and turn your herbs every 15-20 minutes. Remove them from the oven when they feel a little crispy. Allow the leaves to cool at room temperature. You may also wish to experiment with a solar or home-made dehydrator. A friend of mine made one with a light bulb, fan, and cardboard box and claims it works great. If you have a wood stove, simply place the herbs on a screen on top of the stove or hang the screen from the ceiling above the stove. The dry heat will quickly dry your leaves. Single layer of raspberry leaves on a dehydrator tray. Once your leaves are completely dry, it's time to grind them. I like to grind the leaves in batches, as needed, throughout the year. Freshly ground leaves are more potent than leaves that have been ground and left to sit for months on end. There are several methods to grinding your raspberry leaves. At this point in my life, I prefer a quick and easy method, so I grind my leaves in my food processor. You could also grind your leaves with a mortar and pestle or coffee or seed grinder. If none of these options are available to you, try finely chopping the dried leaves. Store your ground leaves out of direct sunlight in an airtight container such as a glass jar with lid. BREW YOURSELF A CUP OF TEA! My favorite part of the morning is brewing myself a cup of tea. Raspberry leaf tea is part of my rotation of morning teas. Sometimes I drink only raspberry leaf tea, other mornings I mix it with nettles, red clover, or passionflower. It's possible to burn herbal tea leaves with boiling water so I prefer to bring my water almost to a boil then let it sit for a minute or two before making my tea. I like to use a glass teapot with a wire mesh basket for loose tea. I fill the basket up about half way and fill the teapot with the hot water. After it has steeped for about 5-6 minutes, I pour myself a delicious cup of raspberry tea! Although there are benefits to drinking a cup or two of tea a day brewed as described above, if you'd really like to make the most of the medicinal qualities of raspberry leaf or other teas, try a medicinal strength tea. My favorite way to brew a medicinal tea is a cold infusion. As I learned in my herbal studies with Arctos School of Herbal and Botanical Studies, a cold infusion is made with one ounce (by weight) of herbs and one quart of water. To make it, you will need a wide mouth quart jar, two-piece canning lid, cheesecloth, and one ounce of dried raspberry leaf. Make a little hammock at the top of the jar with the cheesecloth and secure it using the lid ring. Put your ounce of raspberry leaf into the cheesecloth and slowly pour cold water over the herb, completely saturating it while filling the jar to the top. Carefully remove the ring, place the flat lid over the herbs, wrap the cheesecloth up over the lid, and replace the ring. Let this sit overnight (up to 12 hours) for a strong, earthy tea. In the morning, remove the cheesecloth and squeeze as much tea as possible from the herbs before enjoying your medicinal tea throughout the day. I keep my quart jar of medicinal tea in the fridge and pour glasses of it throughout the day. The tea will last up to 48 hours when refrigerated. Raspberry leaf has many benefits. It is most commonly used as a uterine tonic during pregnancy. I began drinking it when I was pregnant and haven't stopped! It is also packed with vitamins and minerals (especially calcium and iron), which are great for anyone (men included!). 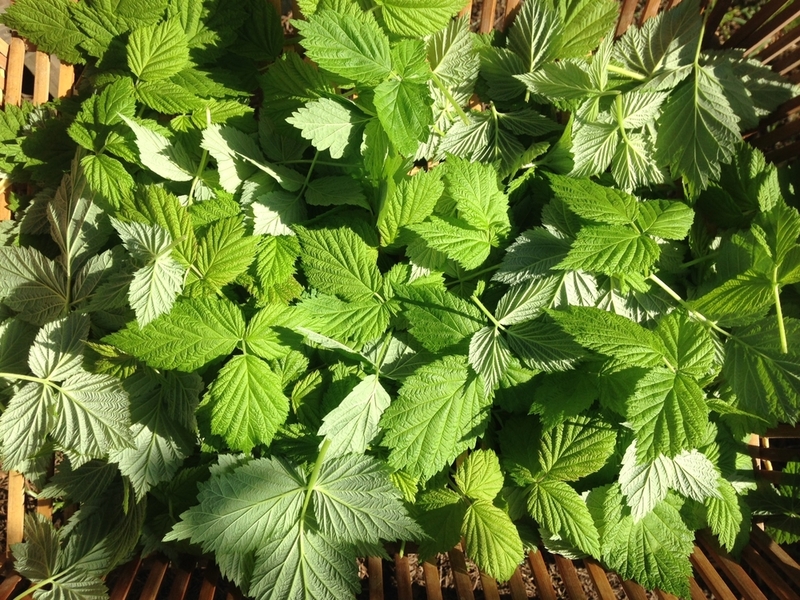 I love raspberry leaf tea for several reasons: it's tasty, I can harvest it from my own garden, and it's packed with vitamins and minerals (especially iron, which I always need). By growing, harvesting, and drying my own raspberry leaf tea, I have a stronger connection with the plant. In my opinion, that makes it's flavor and medicinal qualities even better! Do you have any experience with raspberry leaf tea? Do you harvest and dry your own tea leaves? If so, what are your favorite plants to work with?